You might have heard we’ve had a bit of snow in the UK in the last few days. 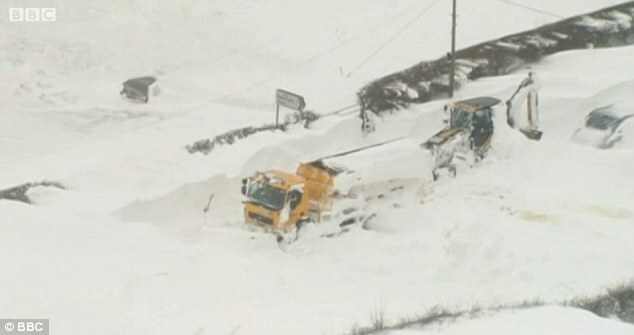 Snow plough/gritter and digger stuck in drifts in Cumbria, March 23rd 2013. Source: BBC via Daily Mail. The blockades have closed many roads in the area, while the M6 between Hackthorpe and Shap is only passable with care. In terms of snow accumulations and the effect on people’s lives, this is a significant event, which began on Friday evening (22nd). In many places it snowed heavily for 24 hours or more. That was it! Nothing about drifts or the difficulty of measuring level snow depths in windy conditions. No discussion. Talk about understatement! Since the Met Office is so fond of probabilities, what is the probability of all UK Meteorological stations completely missing areas of significant snow accumulations? 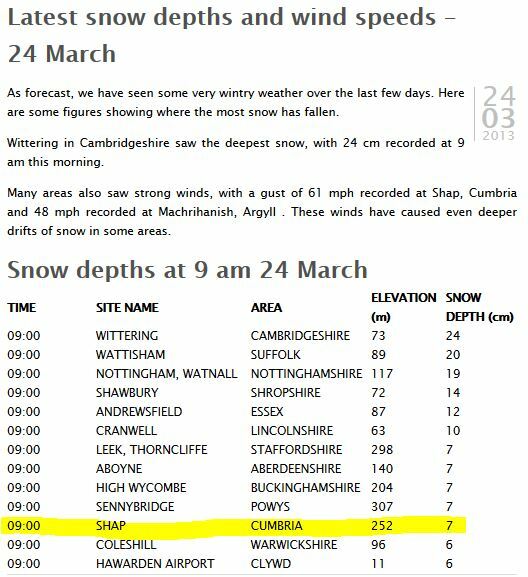 If this is how snow depths for March 24th are going to go down in the Met Office records, what does this say about weather statistics? This entry was posted in News, Weather and tagged Met Office, snow, Weather news. Bookmark the permalink. What meteorologist/climatologist should now be able to explain, why the North Sea and westerly Baltic are so cold, and whether it is partly due to anthropogenic causes. At this time of the year the regional sea areas have lost the entire heat stored during the previous summer. Any human activities, whether shipping, fishing, off-shore wind farms will significantly increase evaporation and cooling down the sea water. 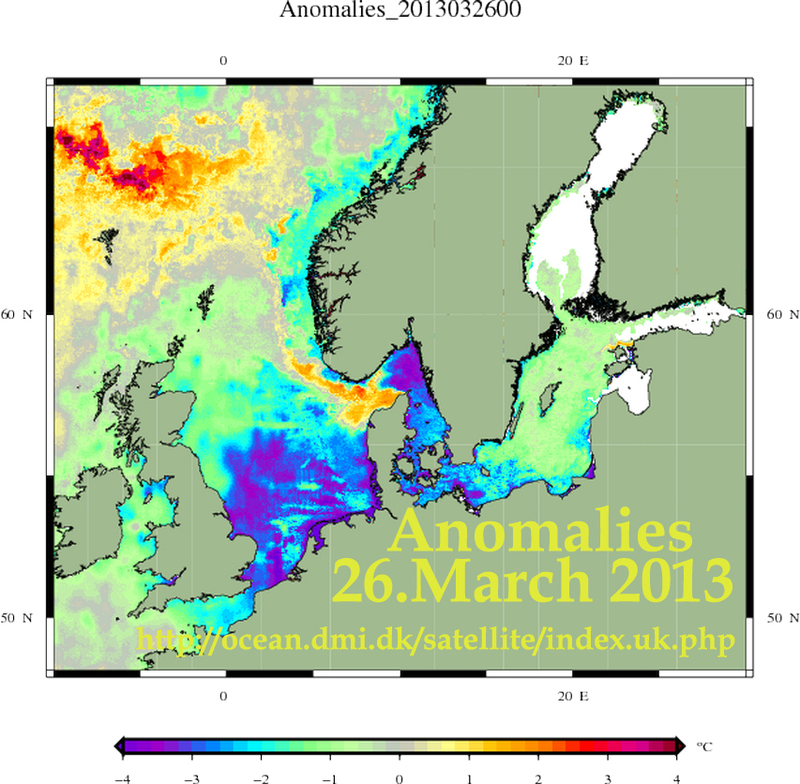 It seems time to know exactly how much human activity in adjacent sea areas has contributed to the extraordinary weather condition from London to Moscow during March 2013. Many Norwegians stay in their cabins in the forrest or high in the mountain during Easter. Mostly going skiing cross country or downhill. This Easter has so far, for me and many in southern Norway, been calm winds, 99% sunny during daytime and very cold during night, minus 20 deg C.
Blocking high pressure over Norway shipping cold air upon Western EU and keeping the “polar front” over UK? The question which should have been asked is: Why is the high pressure locked over Scandinavia and what role do the North- and Baltic Sea have in this scenario? Wishing a Happy Eastern Season. Norway is one of my favourite parts of the world. Friends and relatives there have been enjoying the lovely sunny weather. In mid February, 1947 there was a tremendous snowfall. In South Wales the snow collected in the smaller roads that were lined with bushes and I remember the tips of the bushes poking through the snow as we walked at “bush top” height. The snow persisted until the end of March so thousands of animals died because farmers could not get food to them. It makes one appreciate the benefits of “Global Warming”. Headline to a brief text in NYT (Jan. 19) – Europe in mid-January 1940. “Cold relaxes its grip on North Europe . Only Finland still suffers in 58-below-zero weather, a 60-year cold spell. Schools in the Reich closed. Low temperatures, sleet and snow in Portugal , Spain and northern Italy . __Ice-storm. The duration of the storm was remarkable lasting up to 48 hours in some places……. 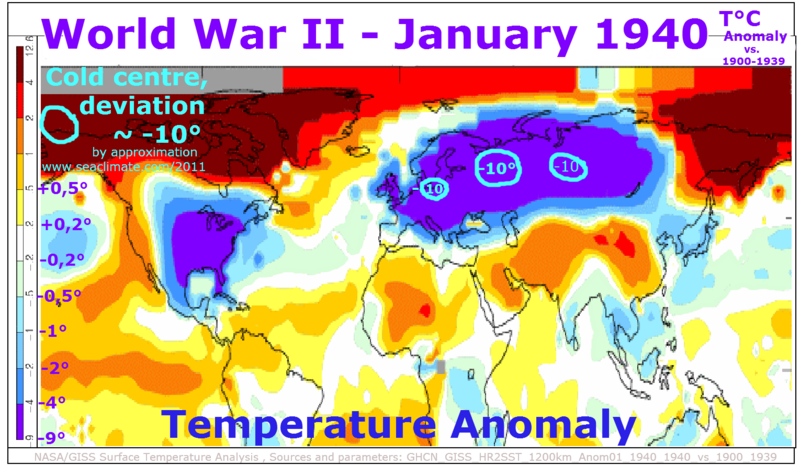 The flow of cold air towards the Atlantic coast could not have happen without sub-cold regional sea areas in January 1940. Something must have generated it, and the most likely cause was naval activities since 1st Sept.39. Man made a huge field experiment, and meteorology is not able to investigate and understand the situation. So they are not able to analyse the contribution of the regional sea areas and human sea activities may have had on the cold and snow in March 2013.